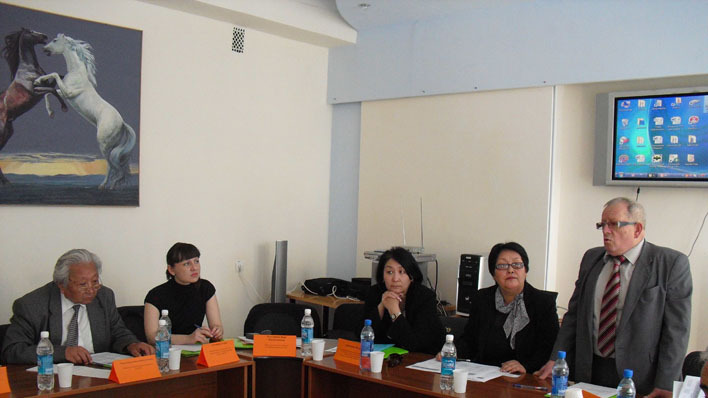 September 29, 2009, Bishkek – a consultative meeting on the issues of the development of the “Integrated Water Resources Management in Kyrgyzstan” course was conducted for Kyrgyzstani Universities. The meeting was organized by the Centre of Sustainable Development (Bishkek) and The center “Cooperation for Sustainable Development of the RK” (Almaty) supported by the UNESCO Cluster office for Kazakstan, Kyrgyzstan, Tajikistan, and Uzbekistan in Almaty. Upgrading of the system of water resources management and protection via the implementation of the Integrated Water Resources Management (IWRM) is crucial for solving water use issues in Central Asia. One of the key issues of implementing IWRM in Kyrgyzstan is training of qualified personnel. Lack of guidance materials and university curricula in the area of water resources management is observed now in Kyrgyzstan like in other Central Asian countries. Materials of an IWRM pilot course developed in 2009 with the assistance of UNESCO for Kazakstani universities were presented at the consultative meeting. The workshop participants expressed their concern in the project of developing and implementing such a course for universities of Kyrgyzstan. The meeting was attended by representatives of the Ministry of Education and Science (MES), National Environmental-Protection Agency, Department of Water Economy of the Ministry of Agriculture of the KR, Institute of Water Issues of the MES of the KR, higher educational institutions, non-governmental organizations, international organizations, and IWRM experts. Participants of the meeting expressed their recommendations on the development and introduction of the IWRM course into teaching practice in Kyrgyzstan, on the relevance of the course topics as well as on key priorities of assisting the implementation of the integrated approach to managing water resources in the KR. “We consider round-table meetings of representatives of governmental agencies, academic community and international organizations to be very useful. Discussion has shown that the development of this course is rather timely for Kyrgyzstan, will promote propaganda of innovation approaches in the sphere of water resources management in the Kyrgyz Republic and assist meeting goals of the International Hydrogeological Programme (IHP) of UNESCO and the UN Decade of Education for Sustainable Development” – Aigul Akhmatova, Director of the Centre of Sustainable Development commented the meeting outcomes. Pilot course developed with the assistance of the UNESCO Cluster office in Almaty is the contribution for the programme of “Water education for Communities, Stakeholders and Mass Media professionals in Central Asia” and UN Decade of Education for Sustainable Development. For further information please contact Yelena Yerzhakovich, Natural Sciences Programme Consultant, e-mail: y.yerzakovich(at)unesco(dot)org.